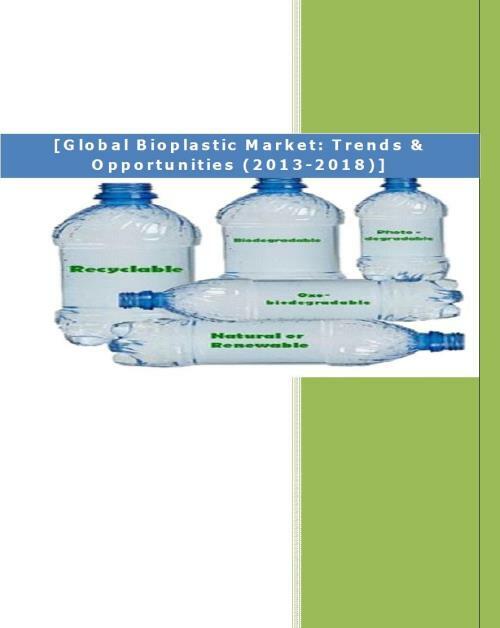 The report titled “Global Bioplastics Market: Trends & Opportunities (2013-2018)” provides an in-depth analysis of the global bioplastics market with detailed analysis of various regions like Asia, South America, North America and Europe. The report also assesses the key opportunities in the market and outlines the factors that are and will be driving the growth of the industry. Growth of the overall bioplastics market has also been forecasted for the period 2013-2018, taking into consideration the previous growth patterns, the growth drivers and the current and future trends. Further, key players of the industry like BASF SE, Arkema, DuPont, Lanxess AG are profiled. A sustainable alternative to traditional plastics, bioplastics are plastics that are fully or partially biobased, and/or biodegradable or compostable. In other words, they are plastics that are made from renewable resources such as corn, tapioca, potatoes, sugar and algae and breaks down faster than traditional plastics, which are typically made from petroleum, and other fossil resources such as natural gas. Bioplastics have numerous applications like packaging, bottles, utensils, furniture etc. Globally, the production capacity of bioplastics is highest in Asia followed by South America and Europe. As Asia and South America are closer to where feedstock is grown, the production capacity of bioplastics is higher in these regions. Growing sensitivity to climate change and increasing prices of oil have together contributed to rise in demand of bioplastics products. A number of laws such as the ban of plastic bags and disposal of waste are accelerating the demand of bioplastics. Few challenges that the bioplastics industry is facing are lack of biobased feedstock, lack of composting and other industrial biodegradation infrastructure and lack of a clear understanding of the various bioplastics related regulations. New high performance bioplastics is being introduced in the market that can withstand higher temperatures. Many companies are also planning to substitute feedstock with some other biobased material or non food alternative feedstock from biomass, so as to reduce their dependency on feedstock availability.